This post is brought to you by Savills. Whether you’re a professional or a hobby-designer, in one way or another everyone takes inspiration from other people’s houses. We can’t always rely on friends or family’s homes; they may not have a similar style, or they may just not have any style in the first place (and fair enough – not everyone is house proud!). One solution is to take some inspiration from beautiful dream houses. Once the green mist of jealousy subsides, the home-elite can provide a valuable source of creativity. Pinterest (of course), certain television shows, magazines and prestigious estate agents are all excellent sources of luxury home imagery. The key is to look at these properties subjectively; thinking what it is about the place that you like down to the most basic elements of its design, and then consider how that would work in your own house. 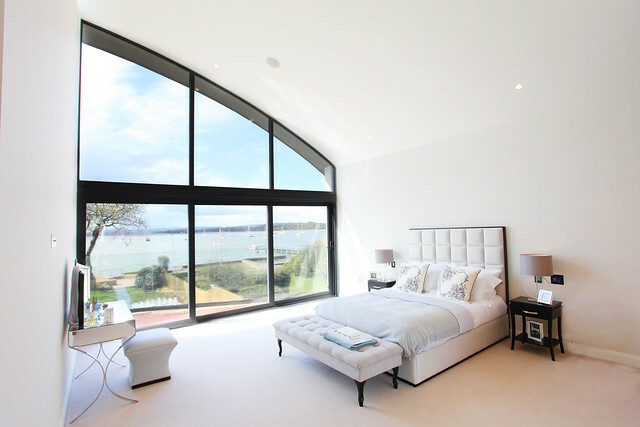 To demonstrate this, one example is the contemporary Branksea Avenue House found at Savills, in Poole, England. This stunning house has 22 photos, all displaying some sort of beautiful touch that could be adapted to some extent, in order to match nearly any style of home. Before even looking at the location, it is clear from the architecture of the property that this is a waterfront home – the waves of the house demonstrate a flawless example of how a property’s design should take inspiration from its surroundings. These contours have been carried on into the landscape of the garden, creating a chic relaxing space. The chess set is a fun and quirky touch too! Both the home gym and the walk-in closet above show how a relatively simple makeover of spare space could make a practical use of an area, as well as an indulgent and dramatic impact. With the right use of materials this could suit any home. Similarly, the elegant design of the simple sauna could encourage many to tackle an ambitious DIY project for unused pool houses (everyone has one of those, right?). The breakfast bar is a fantastic example of how a simple touch of interior remodelling could work wonders in complimenting a somewhat awkwardly shaped kitchen. The lighting used in this room, particularly the colourful strips to the sides of the television, would be an inexpensive and elegant method of transforming an ordinary living room into a home cinema. These examples are based around significant projects such as remodelling and renovating. But similarly, dream homes can provide diverse and stimulating sources of inspiration for smaller interior design projects.